Edited by Richard Jones. Piano Albums. 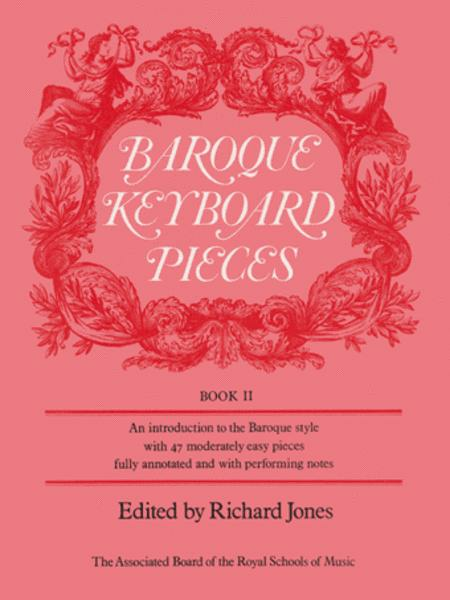 Baroque Keyboard Pieces (ABRSM). Collection. 64 pages. ABRSM (Associated Board of the Royal Schools of Music) #9781854724595. Published by ABRSM (Associated Board of the Royal Schools of Music) (A3.9781854724595). ISBN 9781854724595. 9 x 12 inches. A collection of the keyboard music of the period 1600 - 1750 offering a fairly representative selection of the forms styles and composers of that period. Provides both scholarly performing editions and sources of enlightenment on performance conventions. 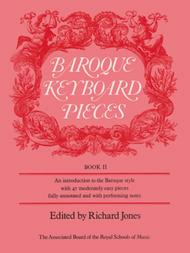 Edited by Dr Richard Jones a leading Bach scholar recently lauded for his edition of The Well-Tempered Clavier. W. F. Bach'" Performed by "Bach, J. S."
Menuetto in Bb (probable early version of 1st Minuet in BWV 825) Performed by "Bach, J. S."
Menuetto in Bb (probable early version of 2nd Minuet in BWV 825) Performed by "Bach, J. S."
"Polonaise in D minor (from Suite No. 2 in B minor, BWV 1067)" Performed by "Bach, J. S."
Jigg in F Performed by "Barrett, J." The Catherine Performed by "Barrett, J." The Bonny Gray Ey'd Morn Performed by "Clarke, Jeremiah"
Trumpet Tune in D Performed by "Clarke, Jeremiah"
"Le Petit-Rien, from 14th Ordre, 'Pieces de Clavecin', Book 3" Performed by "Couperin, F."
La Pastourelle Performed by "Couperin, L."
Menuet In C Performed by "Couperin, L."
"Menuet in F, from 'Musicalisches Blumen-Buschlein', Op. 2" Performed by "Fischer, J. C. F."
"Andante in A, from 'A Collection of Lessons for the Harpsichord'" Performed by "Greene, M."
Saraband in G minor Performed by "Lawes, W."
"Passepied in F, from 'Pieces de Clavecin'" Performed by "Le Roux, G."
"Aire in G minor, from 'Lessons for the harpsichord or spinnet'" Performed by "Loeillet, Jean Baptiste"
"Loure in G minor, from 'Pieces de Clavecin'" Performed by "Mattheson, Johann"
"Sefauchi's Farewell, Z. 656" Performed by "Purcell, H."
"Suite No. 1 in G, Z. 660: 2nd movement, Almand" Performed by "Purcell, H."